Angels Remembered is a Colchester East Hants Hospice program tradition that has been taking place since the early 2000’s and has expanded from Truro to include Tatamagouche, Masstown and Elmsdale. It is a popular event in the community with people actively seeking it out yearly as a way to remember someone they love that has died. Finding a way to remember and honour those who have died can help ease the pain of an otherwise difficult holiday season. This is the idea behind the Colchester East Hants Hospice Society’s Angels Remembered Trees. The purpose of the program is to offer a space for people to acknowledge the loss of an important person in their lives. Members of the community can chose an Angel, add a tag with their loved one’s name and/or a message and hang it on the tree. Volunteers are present to provide information about the Hospice Society and to be a supportive listener as often people like to tell their stories of loss. This a bereavement program not a fundraiser, however some people feel strongly about donating so we continue to provide this opportunity. 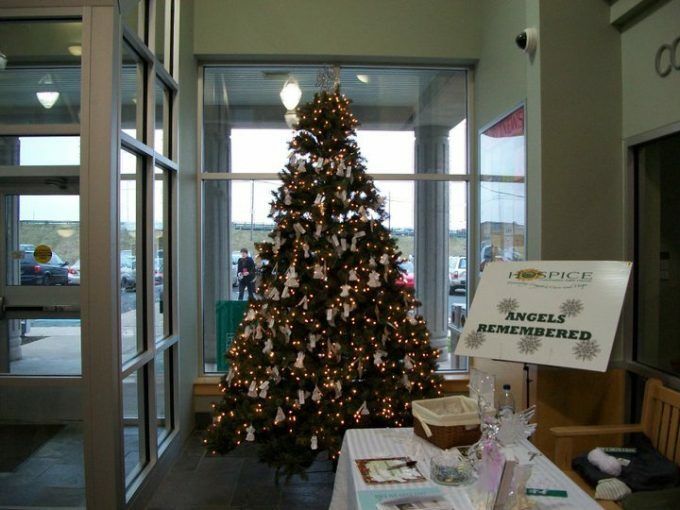 We encourage everyone to come and visit our Angel’s Remembered Tree and hang an angel in memory of a loved one.